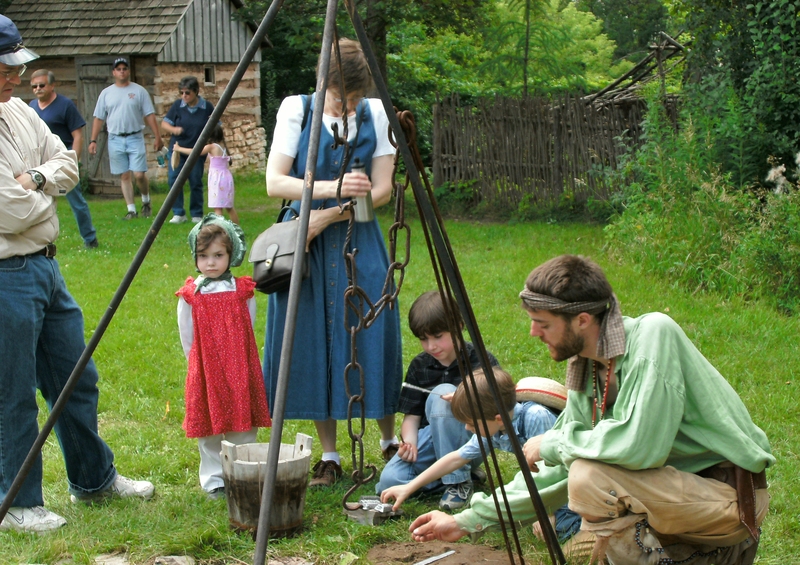 A living history event at Green Bay's Heritage Hill State Historical Park. Green Bay, Wisconsin, (population 100,353) is located at the mouth of the Fox River. The area was first explored by Europeans in 1634, when the French interprète-voyageur Jean Nicolet landed at Red Banks, naming it La Baye or La Baie des Puant. The first permanent European/Métis settlement in Wisconsin was established by Charles Michel de Langlade at La Baye in c1764. The settlement became an important center of the fur trade, attracting many to the area, including the interests of John Jacob Astor. The town changed its name to Green Bay after coming under British control in 1761, coinciding with the construction of Fort Edward Augustus. Green Bay became a part of the United States in 1783, and it was reincorporated as a city in 1854. After the British successfully invaded the Wisconsin Territory during the War of 1812, the United States constructed Fort Howard (active from 1816-1853) near the mouth of the Fox River. Future President Zachary Taylor was once a commander at the fort. Green Bay has developed into an industrial city and is the home of several paper and meatpacking plants. In addition, Green Bay is an important port city linked to Lake Michigan. Since 2002, the Green Bay Historic Preservation Commission has recognized buildings and sites with an annual plaque recognition program. Four categories of awards are presented: “contributes to Green Bay's identity in a unique way,” “endangered historic property,” “significant socially or architecturally,” and “a hidden element of Green Bay's history.” Recognized sites and properties from every year are showcased on the Green Bay Historic Preservation Commission's Web site. The Heritage Hill State Historical Park is a 50-acre park that includes many historic structures and artifacts which interpret the history of northeast Wisconsin. The park focuses on four key areas: the fur trade, Fort Howard, the growing community, and ethnic agriculture. Each key area features at least four historic buildings visitors can experience. A large cadre of volunteers assist with interpretation, special events, front desk support, gardening, carpentry, and collections care. The Betsy Hendrickson and Lucyanna Hitch Education Center is operated on the grounds of the Heritage Hill State Historical Park. The center provides educational programs that meet state benchmarks and standards in history and social studies. The park has become a year round attraction — not only for education, but for business meetings, receptions, and parties.